CJ Ujah insists he is far from intimidated by the world record-breaking exploits of Christian Coleman ahead of next week’s IAAF World Indoor Championships in Birmingham. The American has set the sprinting world alight this year, clocking a remarkable 60m world record of 6.34 at the US trials in Albuquerque to lower Maurice Greene’s 20-year-old mark of 6.39. Coleman’s performance may have come at altitude but he has been in imperious form since he opened his season in January with what had appeared to be a world record of 6.37 in Clemson, only for the time to remain unratified due to the lack of electronic starting blocks. 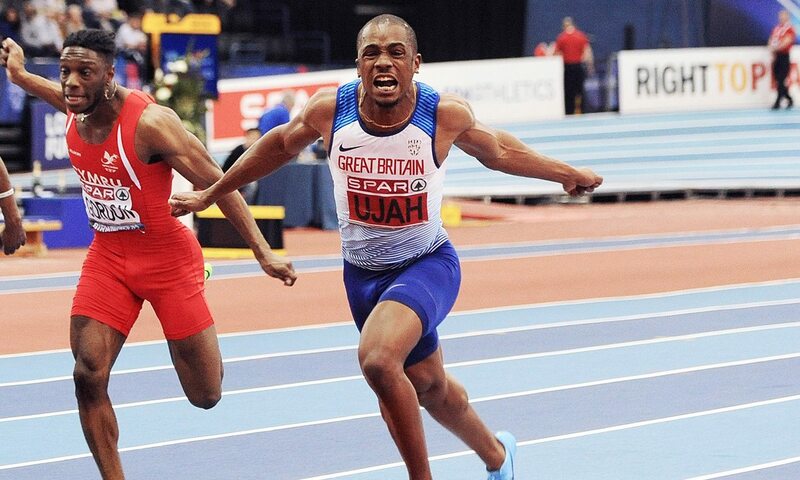 Ujah will come face to face with him at the Arena Birmingham and insists he has been far from surprised at the sprinting events which have unfolded in 2018. “It didn’t shock me,” the man who was crowned British 60m champion last weekend says of Coleman’s time. “Everyone needs to realise that, in the world champs outdoors, he got to 60m in a similar time (during the 100m). It doesn’t scare me. He’s very quick and I’m not taking it away from him but now he has to come and run at sea level in front of a different kind of crowd. “Coleman put down a great time, but can he do it when it counts? “I can’t focus on him. I have to focus on myself and that’s to turn up and execute my race and go with the flow. “There’s a lot of talk around Coleman, Coleman, Coleman. Obviously he has broken the world record but you can’t focus on one person. Ronnie Baker (who ran 6.40 at the trials) was just behind him. You never know what he can bring on the day. I go in and do the job I always do, and that’s compete to the best of my ability. I expect to go there and challenge for medals. On any given day, regardless of what times anybody has run, it’s about the day. Ujah will put the finishing touches to his preparations when he competes in the Müller Indoor Grand Prix Glasgow, his first taste of racing north of the border. He will be up against a field containing fellow world champion Adam Gemili, world 100m finalist Reece Prescod and China’s Su Bingtian, another athlete expected to be a major contender in Birmingham. “This is a big event,” he said of the Scottish challenge. “Every week (indoors) the challenge has stepped up for me. This week there will be some of the world’s best and the following week the Worlds, where it really happens. We’ve organised it that every competition gets harder as we move towards the main goal. A false start and disqualification in the 60m final in Prague three years ago is not a memory Ujah particularly likes to recall. That came just after his 21st birthday and he will be looking to celebrate reaching the grand old age of 24 the day after the conclusion of the World Indoors by adding a new item to his medal collection. Development outdoors has been clear. Ujah was the 100m Diamond League champion, to go alongside his 4x100m success. He has opted not to compete at the Commonwealth Games and will instead focus on the summer season, culminating in the European Championships.